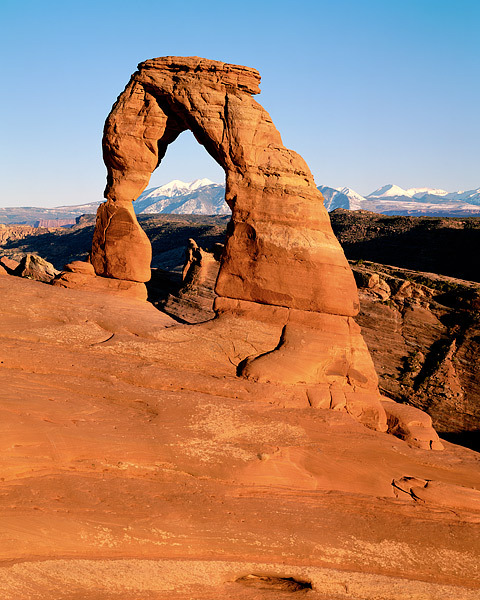 Utah's most iconic location is probably Delicate Arch. Located in Arches National Park, Delicate Arch is found on countless numbers of magazine covers and even the state of Utah's liscense plates. Delicate Arch sits on top of a bench in the National Park and in the afternoon, one can frame the La Sal Mountains located just east of Moab in the iconic arch. Delicate Arch has also been nicknamed 'Cowboy Chaps' due to its likeness to the famous western wear of Ranchers and Cowboys. Photo © copyright by Thomas Mangan.